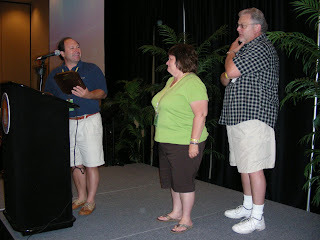 During the Momentum staff meeting on Tuesday morning, Ray and Sharon Feather were given the Wall of Honor award. The Feathers were honored for their significant impact to our churches in the area of Bible Quizzing. Ray is pastor of Grace Community Church in Mukilteo, Wash. He has been involved with Bible quizzing with the Fellowship of Grace Brethren Churches for more than 30 years. Ray and Sharon are pictured at right with TK Kurtaneck, Director of Church Relations & Youth Leadership Training at CE National as TK made the presentation.